These days Austen is very into money. At school they are learning the value of money and how much a penny, nickel, dime, quarters, etc. are worth. He picks up dirty coins off the street and in the park during school which makes me cringe. In fact, one time in a parking lot, he almost picked up a quarter in a nice big grease pool until I told him that I would gladly give him a quarter if he didn't pick up the dirty one! It's funny that on one hand he values all money but the other day, Tom found a ripped $20 bill in his garbage can! He said it was ripped so he threw it away. We have to watch this kid like a hawk with his money because every day after school he likes to come home and empty out his wallet and piggy bank and play with the money. This weekend, I did laundry and found a $10 bill and a $1 bill in his pockets (also a rock). Guess I'm going to have to start checking his pockets before I throw them in the laundry! After all this, Tom and I decided to clean out his piggy bank and put it in the real bank so he wouldn't have access to so much money. Probably a good thing to do every so often anyway. But, I guess we should have done it while he was asleep. He probably wouldn't have noticed it was any lighter. Poor kid doesn't understand the difference between a piggy bank and a real bank. Or maybe he does and he knows that once it goes in the real bank, he'll never get it back for toys or anything else he wants to buy! I felt a little weird this past weekend calling out my son's name in public. 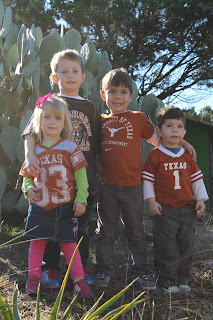 We were visiting friends in Austin, Texas, and I'm sure people thought we were a little strange naming our son after the city they thought we lived in. I wanted to wear a shirt that said, hey, we're from Chicago, but since I didn't have one, he got away with a lot more than he normally would have! Just kidding. We had a great trip to visit our friends and dare I say it was easy with a 3 and 6 year old (think no strollers and car seats to lug onto the plane and then video players for them to watch movies on the plane). Austen has always been an easy traveler but we haven't taken Peyton on a flight for 18 months since she proved to be more challenging. Turns out that time made a difference. She was great. A little nervous with the plane going up in the air and landing on the way to Austin, but on the way home she wanted to look out the window as it took off/landed and her nervousness quickly faded. We hope someday our friends will move back to Chicago. 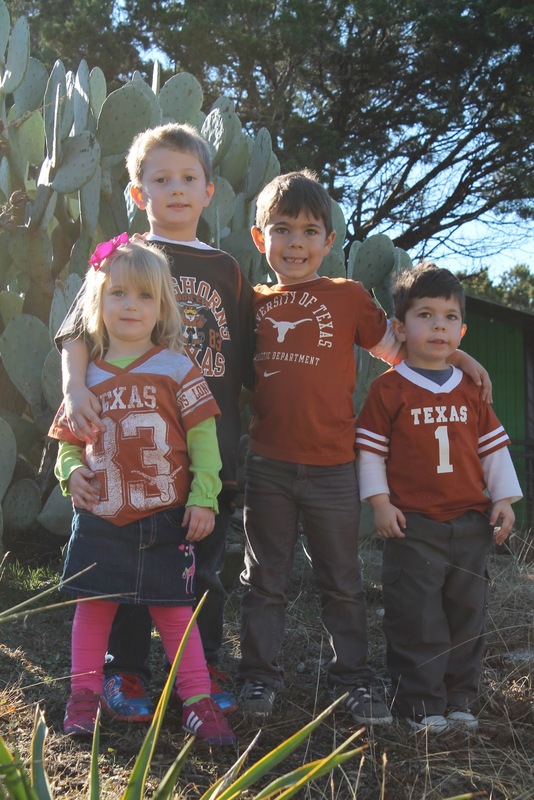 Until then, we'll add to the good food, good friends and good times with many memories in Texas, Chicago and other places. Finally! According to him it took too long because his birthday came last out of all of our birthdays (me, Tom, Adler, Peyton and then finally him). It has been two months of constant birthdays and it took some convincing so he understood that he was born in the first month of the year so his birthday will always be first. I think he half believes us but at least that calmed him down a bit. After school, he enjoyed opening his presents and picked a restaurant for the four of us to go out to dinner. Ironically, he picked the same restaurant where Peyton had her family birthday party. Probably because of the kids movies and inflatable jumpy. They came out and sang happy birthday to him and he started to look a little shy about that (Austen shy?!). 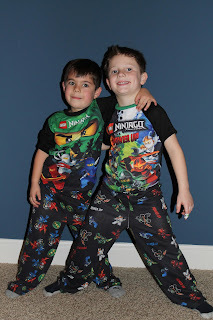 Anyway, Saturday we had his family birthday party at our house complete with a Lego theme. His Uncle Bob took him outside to play with his new football and within 10 minutes it got thrown on a roof. Next year, we'll have more space so that won't happen as often! He enjoyed riding his new bike around our condo which meant he couldn't ride far without running over someone's toes or making Adler bark and he loved making presents out of the new art bin we gave him with all sorts of supplies for his creative "I like to make things" mind. 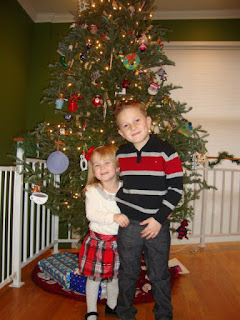 We took down our Christmas tree today so it's only appropriate that I post a wrap up of our Christmas vacation together. This year, we decided to do another staycation with a lot of fun activities for the kids since they were off almost two weeks. It was much more enjoyable this year too since we weren't potty training or changing beds! Some of our stops took advantage of our last year living in the city. We went to Macy's and saw the windows (actually they were pretty bad. Marshall Field's used to have good stories and this year I'm surprised any kids were interested in a bunch of historical facts). 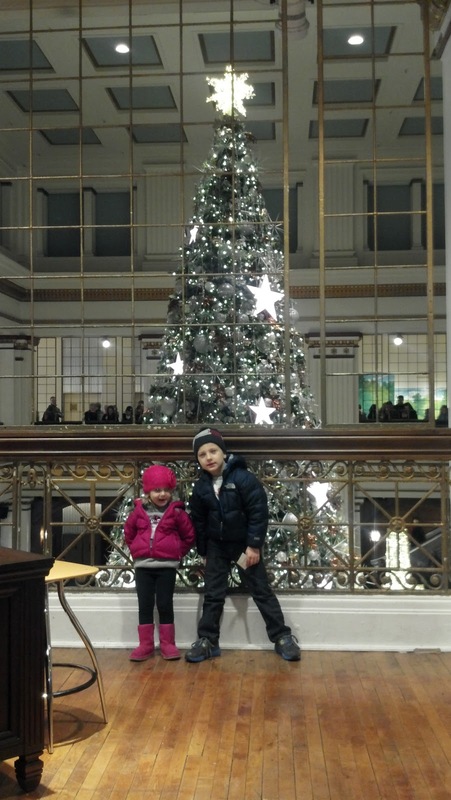 But the kids got to see the big Christmas tree at Macy's too which was actually better than the windows. 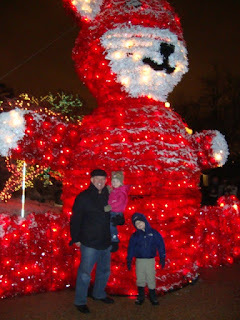 We then ventured to Zoolights with Papa at the Lincoln Park Zoo. We had a great Xmas Eve and Christmas Day with both sides of our families with the kids getting spoiled by all of the presents they received. Santa even made a special visit to see Austen and Peyton on Christmas Day. Austen didn't want to get off the couch to greet him but it was to our surprise that Peyton did without so much hesitation. Favorite gifts were anything Cinderella for Peyton and her new American girl and horse. Austen liked anything Lego. Santa brought him a bunch of pants too. Austen likes to slide on his knees and rip his pants at school so every time he came home with ripped pants, we told him that was one less toy he was going to get at Christmas from Santa and one more pant! All in all, we were very busy. I wasn't ready to go back to work but I think the kids were ready to go back to school and be back in their regular routines. But, they were sad today when we took down the tree and all of the decorations. Austen got pouty and said, I want it to be Christmas again. I'm with you Austen, it's one of my most favorite times of the year. But I know you would miss the beach too!